IN-PART, a technology company that brings together universities and businesses across the globe, today announced that following successful beta testing, it is launching a new, bespoke scouting service for R&D professionals, called IN-PART: Discover. The new service will revolutionise open innovation by providing companies with novel opportunities for collaboration, specific to their requirements, and often unseen elsewhere. In recent years, there has been increasing interest in open innovation, particularly as universities are becoming more aware of, and open to, the benefits of collaborating with industry. However, many businesses have a limited number of university contacts to target when looking for new research and struggle to make new connections beyond this network. There are existing technologies that find new leads for corporate R&D teams, but many of these are neither time- nor cost-effective, as they rely on ‘scraping’ often outdated websites and databases, resulting in irrelevant and unavailable opportunities. By contrast, the IN-PART matchmaking platform features a unique, intuitive algorithm to smart-match companies with the best and most relevant commercially-ready research from 96 university clients - including some of the most prestigious research institutions worldwide. IN-PART: Discover builds on this offering by providing a personalised scouting service, involving not only direct engagement with teams from IN-PART’s established university client network, but also universities around the world. Currently, IN-PART: Discover reaches teams from 272 institutions globally with corporate requirements, and this is set to increase to over 400 universities in the next 6 months. Using a scalable and engaged university network, Discover provides companies with opportunities seeking commercial engagement, tailored to their business’ needs. This new, premium service leverages IN-PART’s valuable relationships with university technology transfer teams, and adds other departments involved in academic consultancy, spin-outs, and research projects, to uncover the latest academic developments and collaboration opportunities, some of which have not yet been published or advertised elsewhere. “Discover was born out of feedback from our industry audience,” said Robin Knight, Co-founder and Director of IN-PART. “Companies are looking for a proactive and resource-efficient way to seek out university collaboration opportunities fitting their own bespoke requirements, before anyone else”. 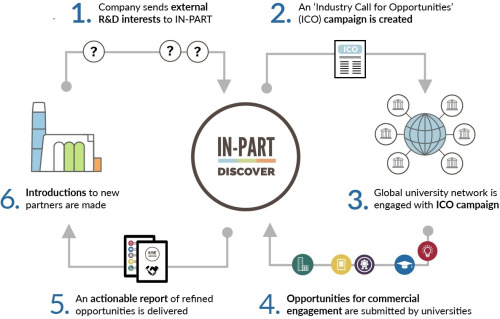 IN-PART works closely with companies to identify their areas of interest and to produce an ‘Industrial Call for Opportunities’ (ICO), which is anonymously sent out to research institutions within IN-PART’s existing extensive network and beyond. All the responses are then collated and filtered into a bespoke, actionable and interactive report for the company to review. Finally, IN-PART provides a personal introduction for each opportunity of interest to ensure that the conversation gets started. Discover was successfully beta-tested with four multinational companies from the healthcare, consumer goods, electronics, and chemical sector. IN-PART is now in discussion with companies spanning from large pharma to aeronautical engineering wishing to use the service.